Heavenly Father, Please help us to be persistent in prayer. No matter what we experience in life...help us to be faithful and tenacious prayer warriors and servants. Help us to make prayer a priority at all times. Even though a lot of our prayer life is in private, there is an aspect of it that is public as we gather in prayer with others. So, please help us to be so persistent in prayer that people see it in us and know that we make You and Your word a priority. Please help us to actually follow-through in prayer when people entrust us with prayer needs. Help us to be persistent like the persistent widow was in getting her case heard! Help us to prayer throughout the day as we continue to seek You! I pray that through the help of your Holy Spirit that we would not allow anything to keep us from communicating with You through interceding and petitioning for others and ourselves...and simply having conversations with you. Help us to not be afraid of being persistent in prayer because You are not afraid for persistence. Lord, we know you use the circumstances in life to shape, mold and change us into useful vessels for You. When times seem hopeless or tough - help us to not give up hope in You! Help us to never give up, period as there's always hope in You! Help us to keep Praying. Help us to keep P.U.S.Hing through! Help us to Pray Until Something Happens because You're always at work and Jesus was the best example Himself of regular, faithful and persistent prayer as He'd often escape the busyness of it all and be found communing with You. Help us to remember that You're ALWAYS at work for Your Kingdom and Glory and You always hear our prayers! Help us to always evaluate our prayer life and adjust it accordingly as we seek to honor You in all things and do what You tell us to do in Your Word! I praise You for the gift of prayer! Help us to keep fighting through it all to communicate with You! 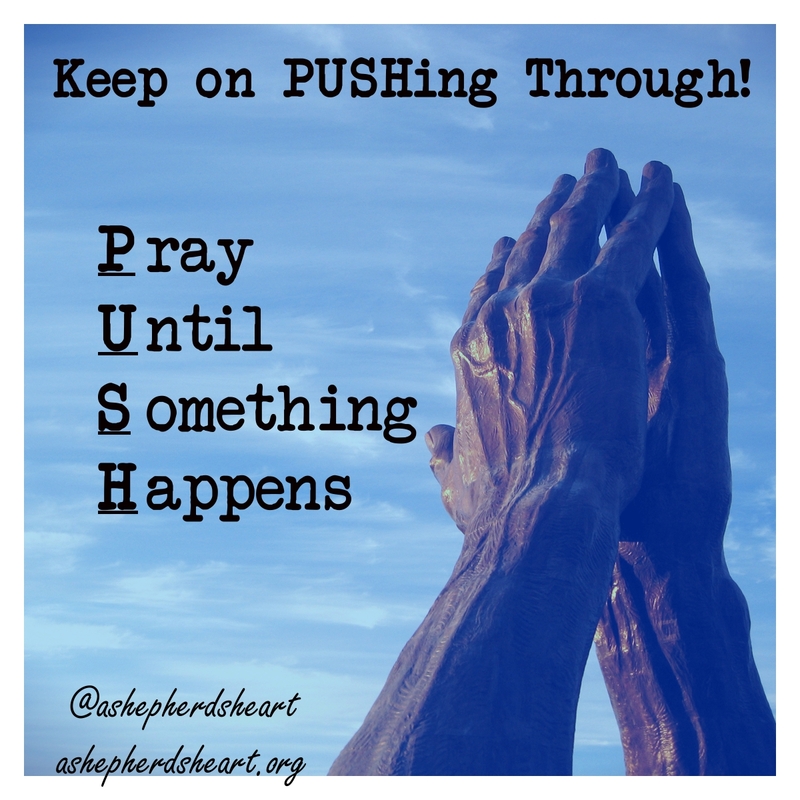 Share this with Someone today: "Prayer is very important so don't give up! Keep On PUSHing through! (P.U.S.H. - Pray Until Something Happens)"